When it comes to healthy eating, how much you eat can be just as important as what you eat. Eating portions that are too big can lead to overeating and weight gain. Follow these tips to manage the munchies while enjoying realistic portions. √ Give yourself a hand! 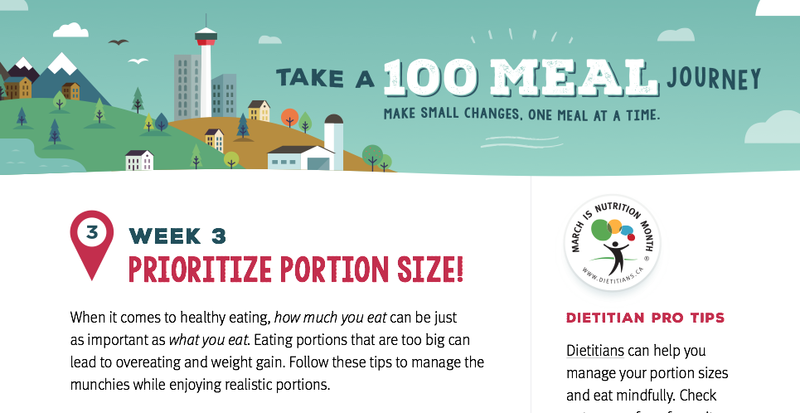 Size up your portions with handy estimates. √ Size counts! Package, plate and portion sizes can influence how much you eat. √ Manage munchies! Keep treat-type snack foods out of sight so you’ll be less likely to nibble. √ Fuel up! For long-lasting satisfaction, eat fibre- and protein-rich foods.